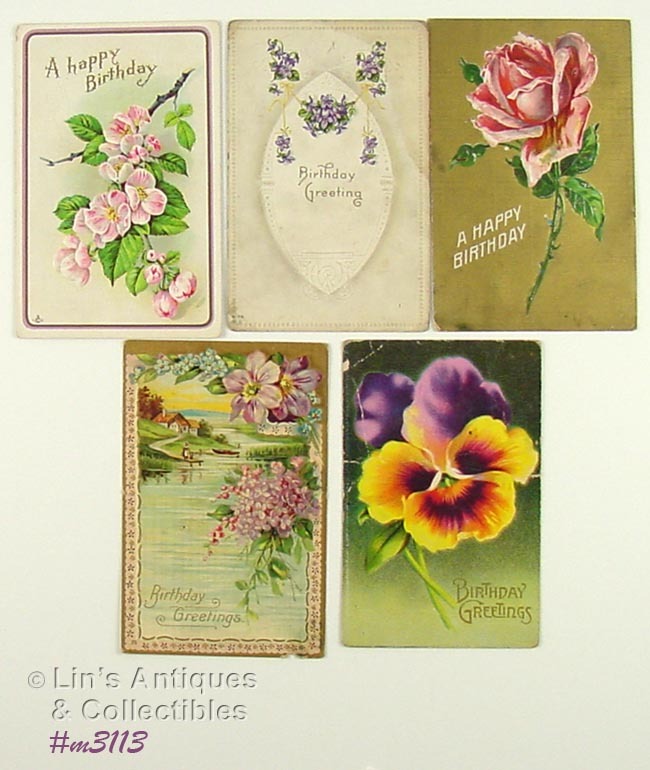 THERE ARE FIVE REALLY NEAT BIRTHDAY POSTCARDS IN THIS LISTING! THREE HAVE HANDWRITTEN “TO” AND “FROM” AND TWO HAVE BEEN MAILED WITH POSTMARK DATES OF 1916 AND 1920. BOTH HAVE ONE CENT STAMPS WITH ONE APPEARING TO HAVE NOT BEEN CANCELLED. FIVE BIRTHDAY POSTCARDS – THREE HAVE BEEN MAILED AND HAVE POSTMARK DATES OF 1909, 1913, AND 1914 AND HAVE CANCELLED ONE CENT STAMPS. THE OTHER TWO HAVE HANDWRITING BUT WERE NOT MAILED. NEAT! 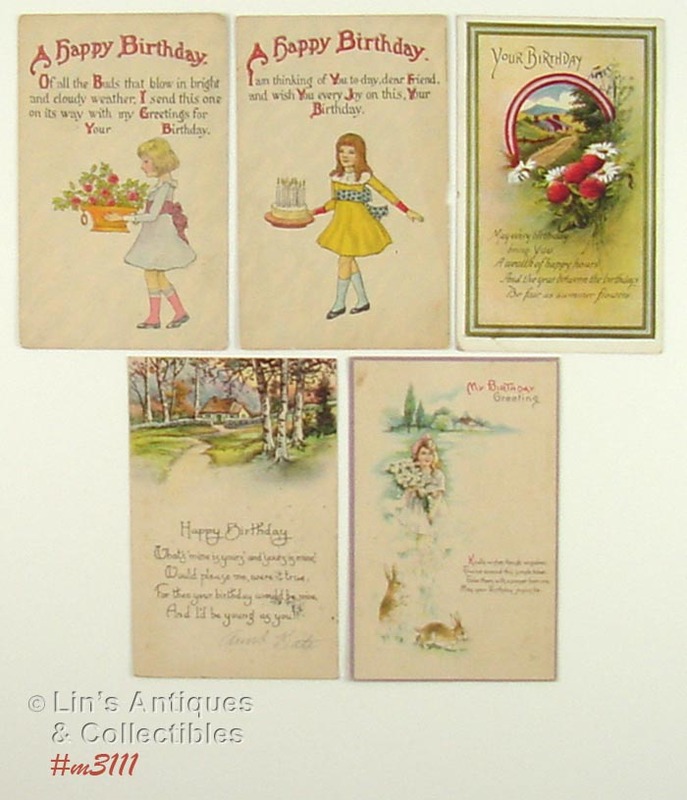 FIVE HAPPY BIRTHDAY POSTCARDS IN THIS LISTING! FOUR HAVE BEEN MAILED WITH POSTMARK DATES OF 1909, 1910, 1914, AND 1919. THREE HAVE CANCELLED ONE CENT STAMPS, ONE STAMP HAS BEEN REMOVED. THE OTHER POSTCARD HAS HANDWRITTEN “TO” AND “FROM” NAMES BUT WAS NOT MAILED. THESE BIRTHDAY POSTCARDS HAVE NEAT VERSES! THE TWO WITH “A HAPPY BIRTHDAY” ARE UNUSED. THE OTHER THREE HAVE BEEN MAILED WITH POSTMARK DATES OF 1917 AND 1921 AND HAVE CANCELLED ONE CENT STAMPS. 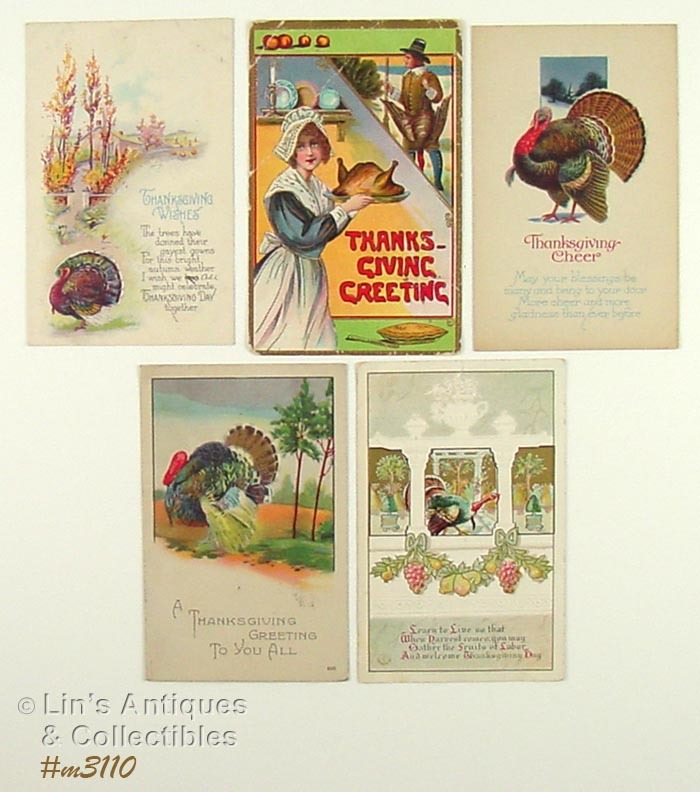 THERE ARE FIVE THANKSGIVING POSTCARDS IN THIS LISTING! TWO HAVE BEEN MAILED WITH POSTMARK DATES OF 1913 AND 1923 AND HAVE CANCELLED ONE CENT STAMPS. TWO HAVE WRITING ON THEM AND ONE IS UNUSED. 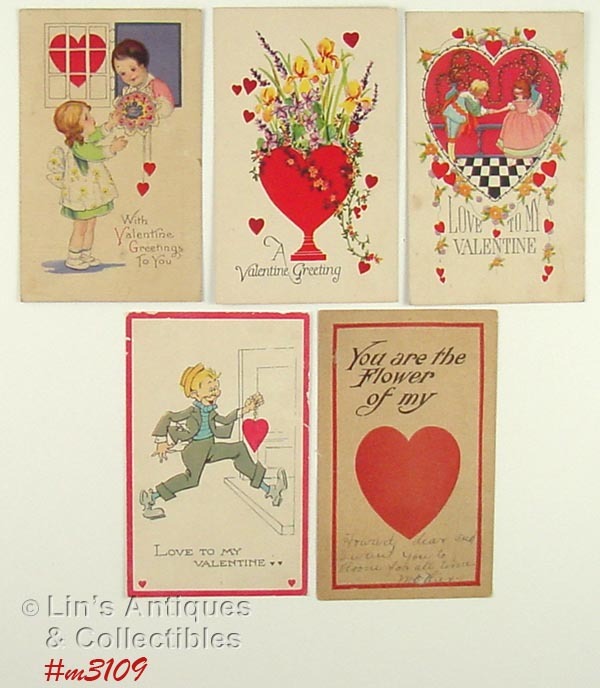 I’VE GROUPED TOGETHER FIVE VALENTINE POSTCARDS IN THIS LISTING! ONE HAS BEEN MAILED, POSTMARKED FEB. 14, 1927 AND HAS A CANCELLED 2 CENT STAMP. THE OTHER THREE HAVE WRITING BUT WERE NOT MAILED. NEAT! 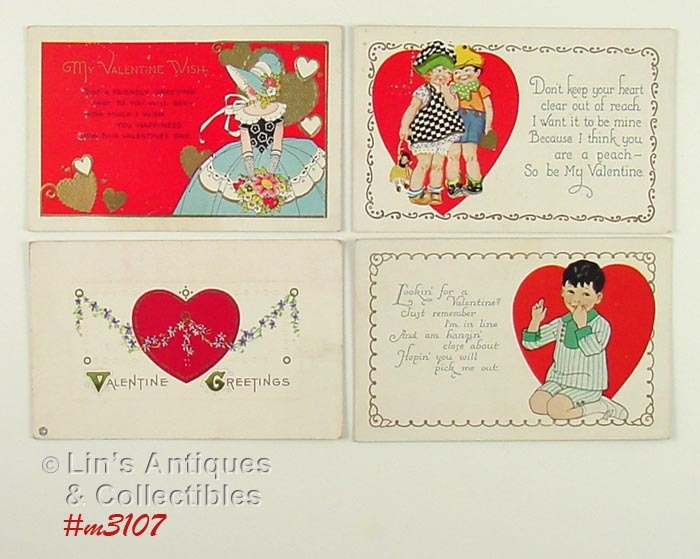 THIS LISTING HAS 4 VALENTINE POSTCARDS THAT WERE NOT MAILED ALTHOUGH ALL HAVE WRITING (MESSAGE OR NAMES). NEAT GROUPING! 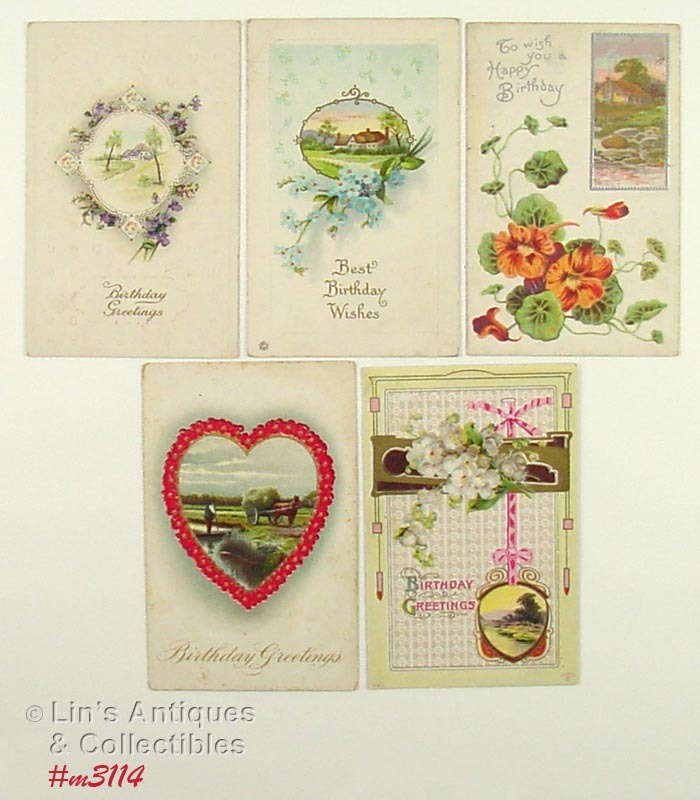 FOUR MORE NEAT VALENTINE POSTCARDS! ONE WAS MAILED AND HAS A PENNY STAMP BUT THE POSTMARK IS ELIGIBLE, TWO HAVE HANDWRITTEN “TO” AND “FROM” NAMES AND ONE HAS NO WRITING (THE ONE WITH THE GIRL). 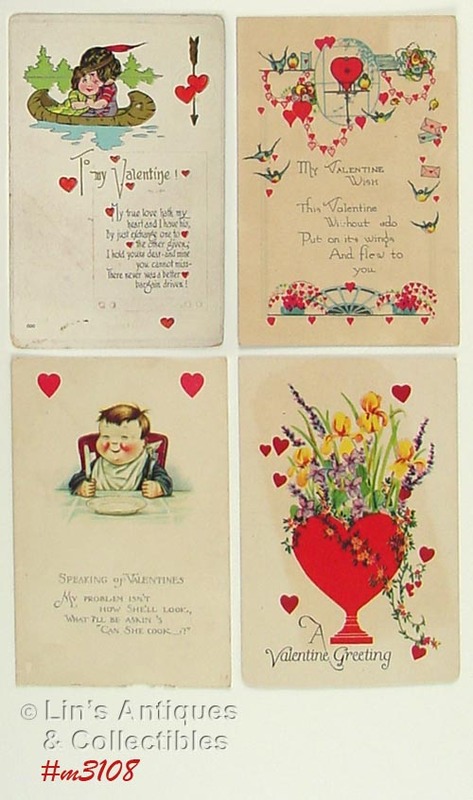 NEAT VALENTINE POSTCARDS! TWO WERE MAILED – ONE STAMP CANCELLED, ONE WAS NOT – AND THE ONE WITH CANCELLED STAMP HAS POSTMARK DATE OF DEC. 28, 1910. ONE HAS A HANDWRITTEN DATE OF 1909. ALL HAVE WRITING ON THEM – A MESSAGE OR “TO” AND “FROM” NAMES. 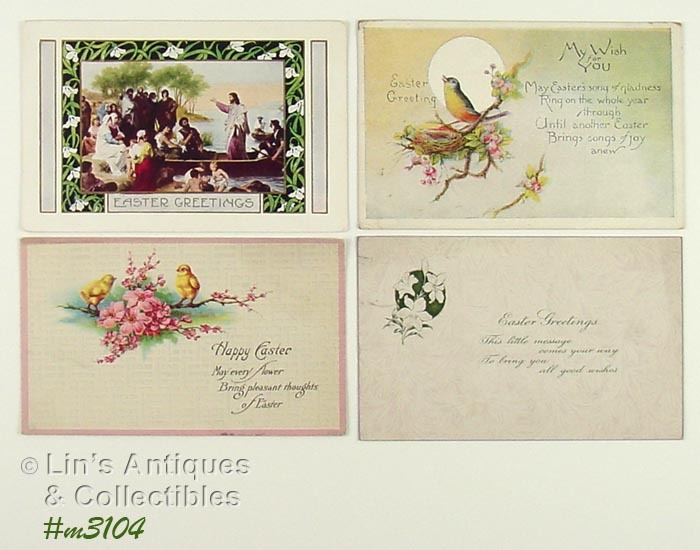 THREE OF THE EASTER POSTCARDS IN THIS LISTING HAVE BEEN MAILED, THE ONE WITH JESUS IN A BOAT WAS NOT MAILED BUT HAS “TO” AND “FROM” NAMES WRITTEN IN PENCIL (POSTCARD IS BY WHITNEY). THE MAILED ONES HAVE POSTMARK DATES OF 1919, 1920, AND 1921. EACH HAS A CANCELLED STAMP, TWO ARE ADDRESSED TO BIRDSEYE, INDIANA, AND ONE IS ADDRESSED TO COXSACKIE, NY. 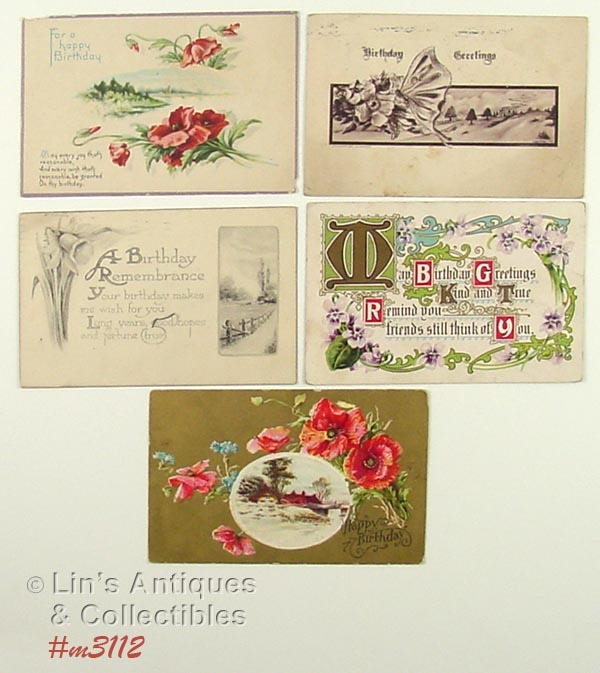 ANOTHER NEAT LISTING OF EASTER POSTCARDS! ALL HAVE WRITING BUT ONLY ONE (THE CROSS) WAS MAILED – FROM BIRDSEYE, INDIANA ON APRIL 15, 1911 AND HAS A CANCELLED ONE CENT STAMP. THE ONE WITH LITTLE GIRL IS BY WHITNEY, THE EASTER LILIES CARD IS BY STEGLER. 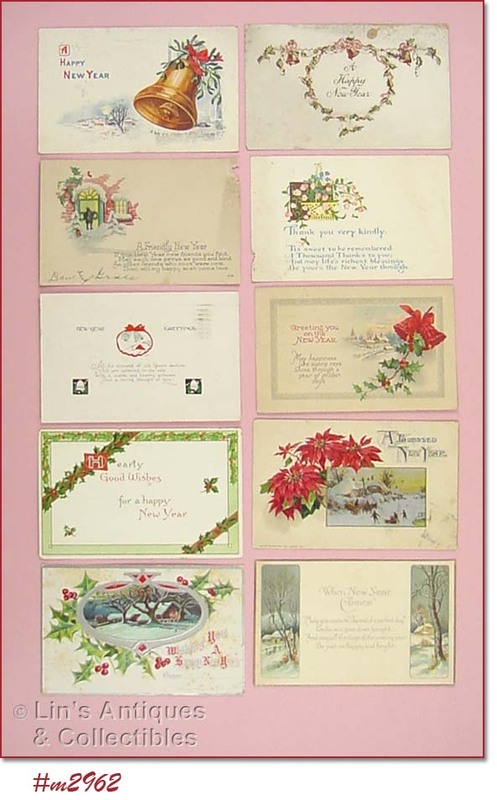 THIS LISTING HAS THIRTEEN HOLIDAY POST CARDS – NINE CHRISTMAS, 4 NEW YEAR’S! I AM LISTING SEVERAL LOTS OF POST CARDS – THEY HAVE DIFFERENT DATES, SOME HAVE STAMPS, SOME DO NOT, SOME HAVE BEEN USED, SOME HAVE NOT – LOTS ARE SOLD AS IS AND AS SHOWN IN PHOTOS. 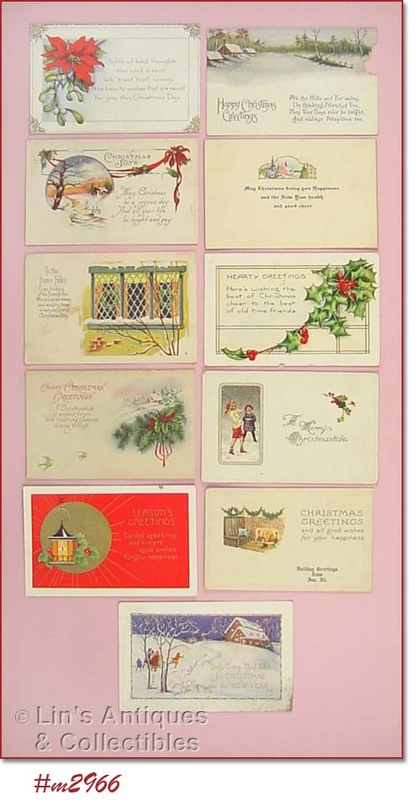 ANOTHER NICE LISTING OF 10 ASSORTED CHRISTMAS POST CARDS! I AM LISTING SEVERAL LOTS OF POST CARDS – THEY HAVE DIFFERENT DATES, SOME HAVE STAMPS, SOME DO NOT, SOME HAVE BEEN USED, SOME HAVE NOT – LOTS ARE SOLD AS IS AND AS SHOWN IN PHOTOS. ELEVEN ASSORTED CHRISTMAS POST CARDS! I AM LISTING SEVERAL LOTS OF POST CARDS – THEY HAVE DIFFERENT DATES, SOME HAVE STAMPS, SOME DO NOT, SOME HAVE BEEN USED, SOME HAVE NOT – LOTS ARE SOLD AS IS AND AS SHOWN IN PHOTOS. LOT OF 10 ASSORTED CHRISTMAS POST CARDS! I AM LISTING SEVERAL LOTS OF POST CARDS – THEY HAVE DIFFERENT DATES, SOME HAVE STAMPS, SOME DO NOT, SOME HAVE BEEN USED, SOME HAVE NOT – LOTS ARE SOLD AS IS AND AS SHOWN IN PHOTOS. 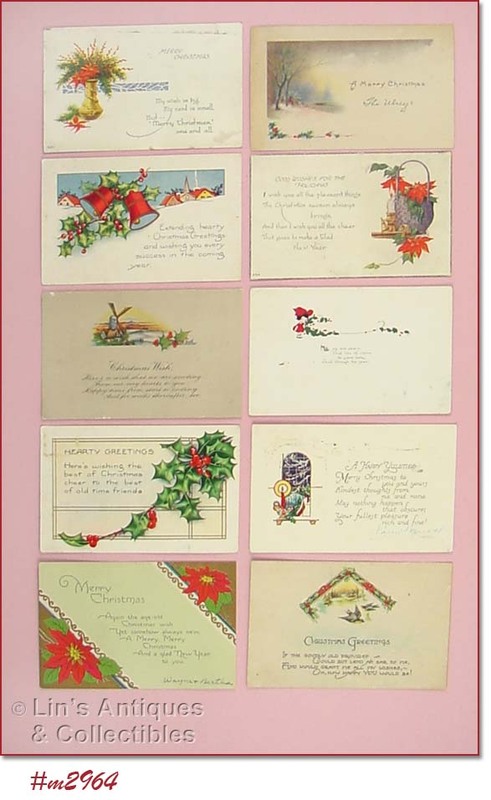 THIS LISTING HAS AN ASSORTMENT OF 10 CHRISTMAS POST CARDS! I AM LISTING SEVERAL LOTS OF POST CARDS – THEY HAVE DIFFERENT DATES, SOME HAVE STAMPS, SOME DO NOT, SOME HAVE BEEN USED, SOME HAVE NOT – LOTS ARE SOLD AS IS AND AS SHOWN IN PHOTOS. 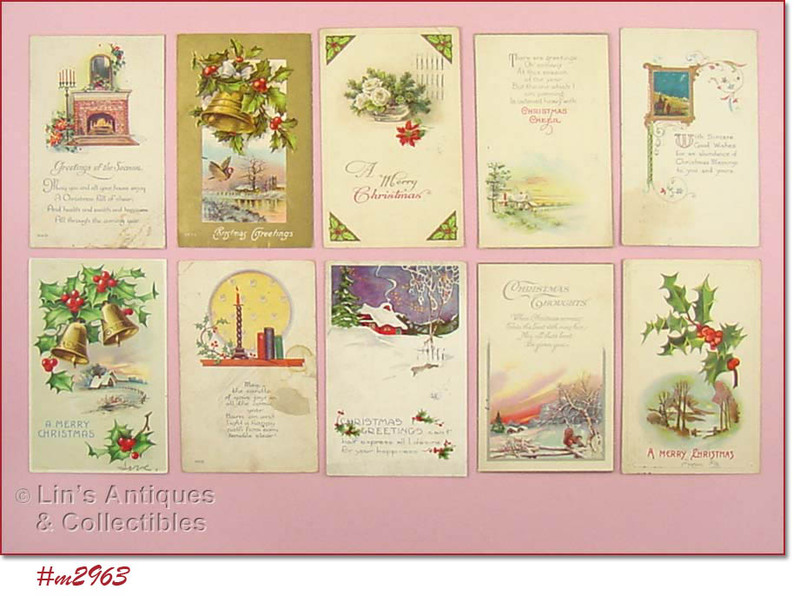 AN ASSORTMENT OF 10 CHRISTMAS POST CARDS! I AM LISTING SEVERAL LOTS OF POST CARDS – THEY HAVE DIFFERENT DATES, SOME HAVE STAMPS, SOME DO NOT, SOME HAVE BEEN USED, SOME HAVE NOT – LOTS ARE SOLD AS IS AND AS SHOWN IN PHOTOS. 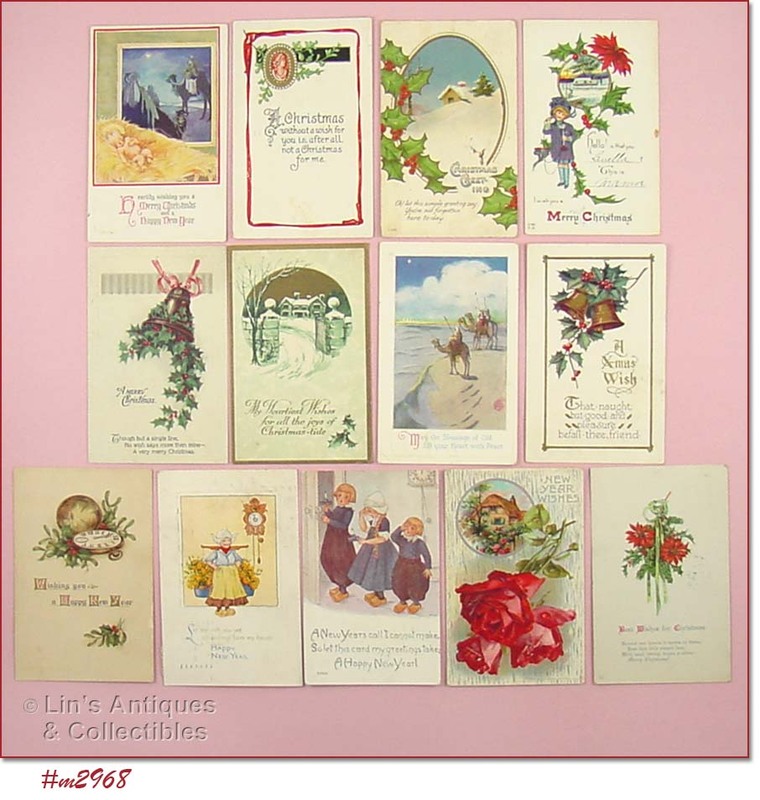 THIS LISTING HAS ANOTHER ASSORTMENT OF 10 NEW YEAR’S POST CARDS! I AM LISTING SEVERAL LOTS OF POST CARDS – THEY HAVE DIFFERENT DATES, SOME HAVE STAMPS, SOME DO NOT, SOME HAVE BEEN USED, SOME HAVE NOT – LOTS ARE SOLD AS IS AND AS SHOWN IN PHOTOS. 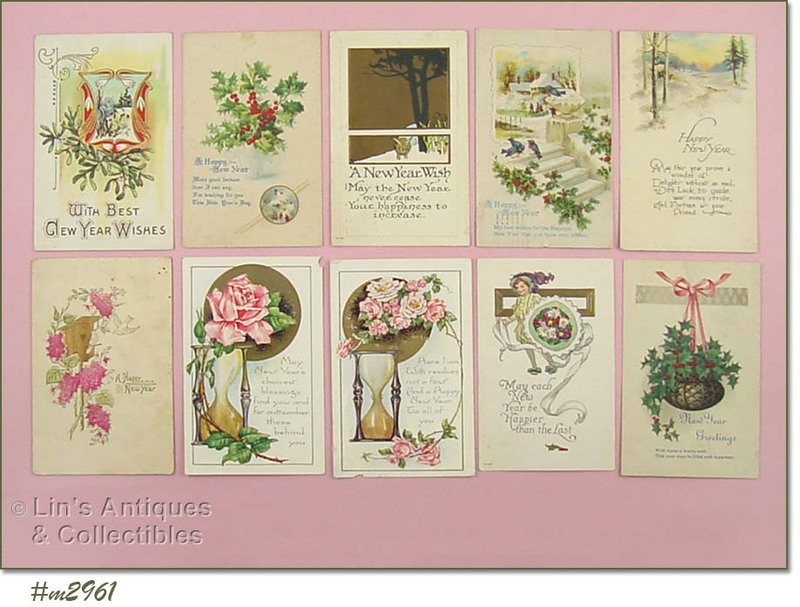 THIS LISTING HAS 10 DIFFERENT NEW YEAR’S POST CARDS! I AM LISTING SEVERAL LOTS OF POST CARDS – THEY HAVE DIFFERENT DATES, SOME HAVE STAMPS, SOME DO NOT, SOME HAVE BEEN USED, SOME HAVE NOT – LOTS ARE SOLD AS IS AND AS SHOWN IN PHOTOS.